Control your Nikon DSLR camera remotely from your Mac via USB. Automatically transfer all captured images instantly to you hard disk and optionally import them into your prefered image library application. Trigger image capture via release button on camera body including high speed shooting or remotely from your Mac via toolbar button, menu item, keyboard shortcut or Apple Remote. Sofortbild automatically recognizes your camera and shows camera model, lens name, focal length, focus mode, exposure value and battery status in a status bar. All major camera settings like shutter speed, aperture, exposure, white balance, iso, image format and size and matrix mode are shown and can be changed from inside Sofortbild. Value changes on the camera body are instantly updated in the application. Images are instantly shown in a full featured, highly optimized image viewer for pixel and color accurate image review. For easier image review several histogram types including luminance and red, green, blue channel are calculated. Contained meta data in image file can be viewed in Inspector. Use fullscreen mode to review image as large as possible without any disturbing controls. 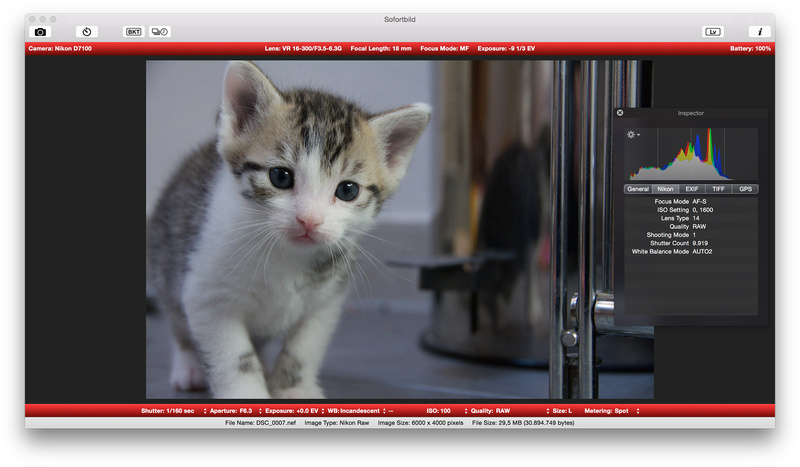 Sofortbild can automatically import captured images into Apple Aperture and iPhoto, optionally launching those application if they are not already running. Pictures are imported into user defined projects and albums or automatically created ones. Auto import into Adobe Lightroom is provided by setting up Lightroom’s watch-folder feature. Customize file name format and save folder and optionally hide file extension. In “RAW+JPEG” mode both image files will get same index. Shooting bracketing series, all image files will get same index with incrementing suffix. Reset index counter to start count from one again. Image Viewer shows most recent captured image including file name and size and image type and dimensions. Zoom image in and out, move it around, show it in its actual size and resize it again to fit into image viewer. Switch image viewer into fullscreen mode for high resolution review. Adjust background color to fit your working environment. Disable image viewer while using auto import to gain maximum performance in photo library application. Choose between six different image histogram modes to review image quality. Browse through complete meta data contained in image file. View camera model, lens name, focal length, focus mode and battery status in status bar. Control exposure status from application while adjusting shutter speed and aperture. View and change shutter speed, aperture, exposure, white balance, iso, image format and size and matrix mode from application. Values changes on camera body are instantly updated in the application. Define self timer delay and number of pictures. Visual and acoustic feedback are given during countdown. Take series of pictures using a constant interval. Define interval by selecting hours, minutes and seconds. Take series of pictures with an arbitrary number of different exposure values for high dynamic range imaging. Define minimum and maximum shutter speed and optionally shutter speed step and delay. Filenames of captured images will get the same index including an incrementing suffix. Automatically import captured images into Aperture and iPhoto. Optionally launch applications if not running. Import pictures into existing projects and albums or create new ones automatically. Setup a watch-folder using the auto import feature to automatically import captures images into Lightroom. Use toolbar button, menu item or keyboard shortcut to capture images remotely. Alternatively press “Play” button on Apple Remote. Depending on focus mode camera will perform auto focus before taking pictures. macOS Mojave (10.14.x), macOS High Sierra (10.13.x), macOS Sierra (10.12.6) or Mac OS X 10.11.6 El Capitan. A supported Nikon camera. Most recent models can be used with Sofortbild. See the full list of supported models. Optionally Aperture, iPhoto or Lightroom. 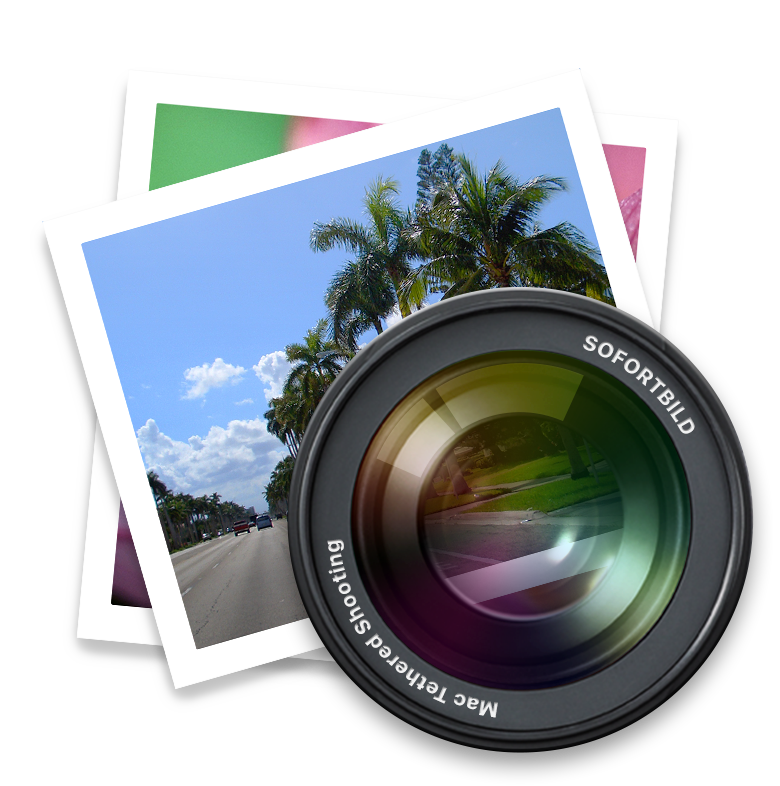 Download the latest version of Sofortbild for macOS High Sierra, macOS Sierra and Max OS X El Capitan, supporting most current Nikon digital single-lens reflex cameras for free. In any case you need help using Sofortbild, have feature request or want to report bugs, don’t hesitate to contact us through the Support page. Sofortbild can be downloaded for free. Support future development by making a financial contribution. This is a good incentive to get new camera models added. Visit the weblog to read the latest information on upcoming versions and stay up to date of Sofortbild development.